Summary Simultaneous dual-band 802.11n router with Gigabit ports based on Ralink silicon and supporting three-stream N on both bands. Not Wi-Fi Certified. 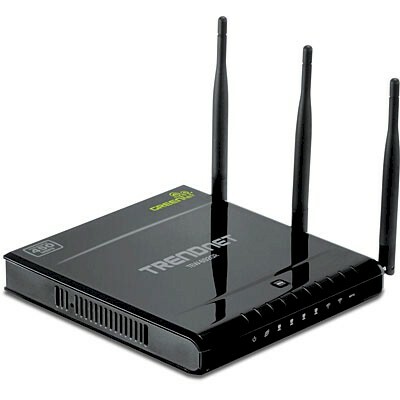 I've had TRENDnet's first simultaneous dual-band three-stream-on-both-bands router sitting in my "To Test" pile for longer than it should have, mainly because I was avoiding the tedium of executing the eight wireless test runs that it takes to fully test it. But this weekend's hurricane gave me a reprieve from yard work and forced me to face the music and git 'er done. The 692GR's physical appearance is a bit different from the TEW-691GR three-stream-on-2.4 GHz sibling I first reviewed over a year ago, then updated with a full set of wireless tests with a two-stream N client a few months later and finally with a bona fide three-stream N client last month. Where the 691GR has a more familiar antennas-on-the-rear configuration, the 692GR's three movable, but not upgradable external dipole antennas are mounted on its side. Figure 1 shows the front panel indicators and rear panel connectors that adorn the glossy black plastic case. There are no mounting screw or ventilation slots on the bottom of the case and note that the power switch is not present on the U.S. model that I received for test. The FCC ID document photo in Figure 2 is a bit fuzzy (Figure 2). But the FCC ID internal photo document has plenty of close-up details for component identification. Like the 691GR, the 692GR uses Ralink radios and CPU and a Qualcomm / Atheros switch. But enabling three-stream operation on both bands simultaneously required some component changes. A Ralink RT3883F 802.11n 2.4/5GHz 3T3R 450/450Mbps Single Chip AP/Router SoC still serves as the router's main processor and also handles 2.4 GHz band duties. For the 5 GHz band, TRENDnet put in a Ralink RT3593 dual-band 3x3 N client SoC. Both radios have Microchip outboard amplifiers in each of their three transmit / receive chain—SST12LP15A for 2.4 GHz and SST11LP12 for 5 GHz. That's what is under the little rectangular RF "cans" you see in the photo. If you look closely at Figure 2, you'll see only one radio (for 5 GHz) connects to the external antennas. The 2.4 GHz radio uses three internal formed-metal antennas affixed to the board at the top and top-right of the photo. TRENDnet made an intriguing choice in the Qualcomm / Atheros AR8327 that provides the single Gigabit WAN and four switched Gigabit LAN ports. Its datasheet reveals that it has both managed switch features and hardware NAT, neither of which appear to be used in the 692GR. 64 MB of RAM and 8 MB of flash finish up the design. Aside from the separate controls for the dual 2.4 and 5 GHz radios, the 692GR's feature set hews close to that of TRENDnet's other routers. Figure 3 provides a taste of the admin GUI, which was generally responsive and lets you do short saves on many of individual pages before you have to wait through a 30 second-or-so reboot cycle to make them stick. There is no HTTPs support for the admin server. Figure 4 shows the 2.4 GHz radio's basic settings, which are duplicated on the 5 GHz side. Note you get four SSIDs on each radio, with each SSID getting its own security mode and MAC association filters. Unfortunately, there are no controls to keep wireless clients isolated from each other or for separating wireless from wired traffic. Full / half / low transmit power control is found on the Advanced pages for each radio. I've put a few other admin screenshots along with a few board component details in the gallery below. For a full feature tour, use the emulator and download the user manual. Detail of the Microchip outboard RF amplifiers for both radios. Setting the four-level uplink QoS requires setting the upload bandwidth first (80 Mbps maximum setting allowed). For each of the four QoS leels you can tweak the % of upload bandwidth allocated.